CableEye Models M2U, M3U, and M3UH look identical on the outside. Internally, M3U series testers use a different circuit board than M2U series testers. The M3U series circuit enables resistance measurement to be made, so you can check the quality of your connections as well as the value of embedded resistors. This photo shows catalog Item 821U, the CableEye M3U system with the CB15 board set attached. Remove the interchangeable CB boards by pressing apart the latches near the front of the board. Choose from over 60 different CB boards to accommodate over 200 standard connector types, and use the CB8 board for prototyping and circular connectors accomodating unlimited connector types. Like the M2U system, M3U series control modules offer a small bench footprint and the ability to handle cables of up to 76 conductors. 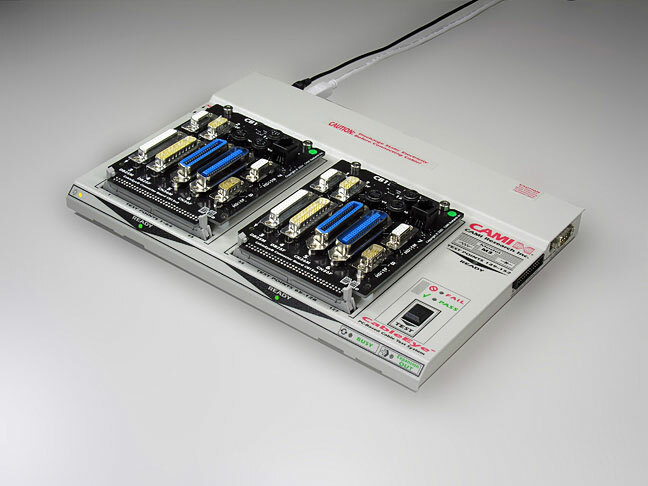 For larger cables or harnesses, attach an expansion module to the bottom of the control module (Item 823 for the M3U, and Item 823H for the M3UH) and vertically stack more until you achieve your desired test point capacity. See below for rear view and side view. USB interface standard. A computer is required even though one is not shown in this photo.